St. James was called the “Greater” to distinguish him from his brother James (the Lesser) who was younger. Both were disciples and apostles of Christ. The name Santiago is a Spanish corruption of San Diego, St. James. According to tradition Santiago preached in Spain and although he died in the Holy Land his body was miraculously transported to Spain where it was buried at Compostela. The cathedral built at Compostela became the greatest pilgrimage site in all of Spain and Europe. In the ninth century he appeared to the Spanish in their battle against the Moors at Clavijo dressed in armor upon a white horse and wielding a sword and banner. He helped rally the Spanish to victory and since then the Church Militant has used him as a symbol in its fight against the infidel. The Spanish brought their devotion to Santiago to the New World as patron of Spain and soldiers of the conquest where he miraculously appeared in battles against the native peoples. Eventually, Spanish and Mexican settlers brought him to New Mexico where he again appeared during battles against native people. New Mexican artists called santeros painted his image on pine panels with natural pigments and sealed with pinon sap varnish. 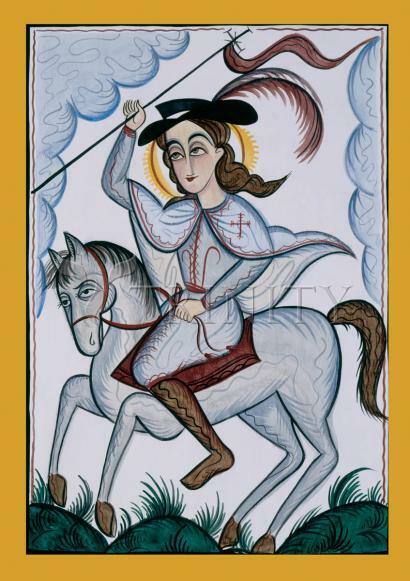 In this retablo of Santiago, the saint represents the fight against injustice, ignorance, and intolerance and for these causes he is invoked. James was the son of Zebedee and Salome, brother of St. John the Apostle, and may have been Jesus' cousin. He is called "the Greater" simply because he became an Apostle before St. James the Lesser. James was apparently a disciple of St. John the Baptist. Fisherman. He left everything when Christ called him to be a fisher of men. He was present during most of the recorded miracles of Christ. James preached in Samaria, Judea, and Spain. He was the first Apostle to be martyred. The pilgrimage to his relics in Compostella became such a popular devotion that the symbols of pilgrims have become his emblems, and he became patron of pilgrims. His work in Spain, and the housing of his relics there, led to his patronage of the country and all things Spanish; for centuries, the Spanish army rode to battle with the cry "Santiago!" "St James!"